People are bombarded by literally thousands of messages everyday. There are so many messages coming at us that we create our own barriers to limit them - from personal "gatekeeper" assistants who stop annoying marketing from reaching our desks, to automated spam filters, delete buttons, trash cans, unsubscribes, and just plain going numb and not really "seeing" the messages. And it's only getting worse. For today's marketer, this presents a formidable challenge. How do you get past the personal barriers and deliver your marketing message to your target audience? First, you need to stop doing what everyone else is doing. If your target audience is getting a ton of emails, then send direct mail. If your target is ignoring print ads, try a social media blitz, or an outdoor ad. Whatever is the norm, do the opposite. There are a lot of really cool ways to communicate your message. How about a Chinese food box with custom fortune cookies inside? Or, print your message on a 36" poster-size news page printed on actual news paper. You can personalize it with your recipient's name and the name of their business. Or, a custom pre-paid Visa card - if your budget allows. 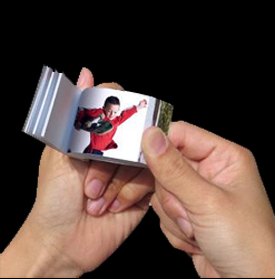 Or, an old-fashioned flick book that animates your message. All of these and more are sure to raise the eyebrows of your recipients and make your message stand out. Dr Brando will help you come up with ideas like these and more. Plus, we will work with you to fully develop them to completion. This is really fun stuff.